A museum for the “Naschkatze”! Wherever one may live on any of the five continents, it’s impossible to think of chocolate without thinking of Germany, for German chocolate sets the benchmark (“der Höhenfestpunkt”) for two very close, competent rivals, Swiss chocolate and Belgian chocolate. The difference is that German chocolate is simply better, not only because it is a product of efficient German commercial interests, but also because chocolate is a true German passion. The Imhoff-Schokoladenmuseum – one of a kind! The Chocolate Museum—the only museum in the world devoted exclusively to chocolate—was established in Cologne in 1993 by Dr. Hans Imhoff (12 March1922 – 21 December 2007). Imhoff’s love of chocolate began in his childhood in Cologne’s Fleischmengergasse, where he lived, quite near to Cologne’s central library and also quite near to Cologne’s Stollwerck chocolate factory, founded in 1839 by Franz Stollwerck. The aroma of the Stollwerck factory’s products—chocolate, marzipan, and gingerbread—entranced young Imhoff, who indulged his love of chocolate by establishing a chocolate and sugar factory after World War II and successfully producing generic chocolates. A few years later, Imhoff bought Berlin’s Hildebrand chocolate company, Germany’s oldest manufacturer of chocolate and famous for the “Scho-Ka-Kola” brand. Imhoff later rescued the failing Stollwerck business enterprise, reorganized its management and marketing, and enabled his now extensive European Chocolate Group to buy such famous brands as Sprengel and Sarotti. Claus Jacobi wrote the definitive biography of Dr. Imhoff, Der Schokoladenkönig. Das unglaubliche Leben des Hans Imhoff (Langen Müller, München 1997). Chocolate plays a significant role in many Germany holiday traditions, including cultural and familial celebrations—in the form of candy. The annual Advent calendars often include chocolate doors between the First Sunday of Advent and Christmas. Advent wreaths also become a conduit for chocolate. A new candle is placed in the Advent wreath every Sunday, after which, the family sit together sipping their hot chocolate and enjoying one another’s company. Every 5th of December, St. Nicholas Day, either St. Nicholas or his sidekick, Knecht Ruprecht (who is quite scary looking! ), would bring a bit of chocolate to the children. The family Christmas tree also partakes of the celebration of chocolate, for, included in its decorations, are decorative pieces of chocolate candy. There are, of course, chocolate Santas to meet everyone’s Christmas-chocolate cravings. Easter brings chocolate bunnies and chocolate eggs as well. 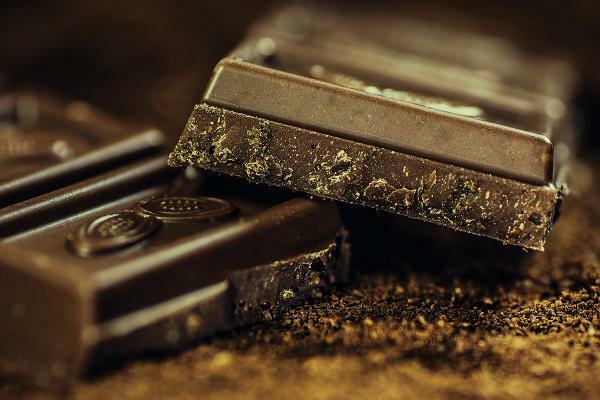 Remember, chocolate is loaded with carbohydrates, which provides quick energy when needed, and it has healthful amounts of the antioxidants caffeine and the alkaloid theobromine. The museum underscores what is the routine use of various chocolate products in German life, from bitter-sweet and semi-sweet dark chocolate, through milk chocolate, white chocolate, and couverture chocolate, used primarily in baking in quite familiar formats, e.g., chocolate bars, either entirely chocolate or, more likely, chocolate mixed with other delightful foods, such as nuts (hazelnuts are a distinct favorite), strawberries, yogurt, peppermint, nougat, marzipan, coffee—even bacon! Then there are the quite popular romantic gift of filled chocolates, i.e., pralines, filled with all sorts of complementary sweets such as liqueurs and/or nuts and candied fruits. The museum’s collection is as extensive as it is varied, beginning, of course, with a succinct time-line history of the discovery of chocolate in pre-Columbian Mesoamerica, where the cacao tree was first cultivated more than three millennia ago by the Maya, Oltec, Toltec, and Aztec civilizations. The cacao beans were used both as currency and, after processing, as a beverage, particularly a ceremonial beverage. The museum shows that, eventually, the beverage conquered Europe in the 17th and 18th centuries and was deemed so precious by the idle rich that it was served only in porcelain and silver containers. The museum goes on to show the cultural history of chocolate as it sprouted and flourished in the 19th and 20th centuries through retail shops catering more and more to an expanding audience of devotees through a recreation of a typical popular candy-shop interior and with numerous examples of early advertising of chocolate products cleverly masquerading as “samplers” and collectibles of various sorts to be kept in scrapbooks and revered as if they were family photo albums. The Chocolate Museum’s exhibition starts with the harvest of the cacao bean in a tropical greenhouse through to the raw product’s eventual arrival in a chocolate factory. An impressively tall (three meters) chocolate fountain greets visitors to the exhibition. The next level of the exhibition includes a chocolate studio displaying hollow chocolate products that include various fillings such as truffles. If you want to try your hand at being a chocolatier, the museum offers both courses and the opportunity to exercise your skills. Knowledgeable museum docents will explain the four-thousand-year history of cacao from the first frothy beverages to contemporary candy products. You’ll also be treated to examples of early advertising of various chocolate products that will bring a smile to your face. You’re also invited to enjoy the always running chocolate fountain. Where can the Chocolate Museum be found and when is it open? The Chocolate Museum is located between the old town and the Rheinau harbour on the banks of the River Rhine. For explicit directions via auto, bus, train, taxi, and the Schoko Express, go to http://www.chocolatemuseum-cologne.com/visitors/getting-here/. The telephone is 49.221.931.888.0 and the eMail is service@schokoladenmuseum.de. The Museum is open Tuesday through Friday, from 1000 until 1800, and Saturdays, Sundays, & bank holidays from 1100-1900. In addition, it’s also open on the 21st of March, every Monday in July, August, and December, and on the 10th, 17th, and 31st of October. Tickets are priced as follows: adults: €9,00; Groups from 15 persons: €8,50; Eligible discount: €6,50 Groups from 15 persons: €6,00; Family ticket: €25,00 (2 adults their children up to age 16); children, students, apprentices, school pupils are entitled to this discount. Voluntary service-providing, disabled persons, and senior citizens (at least 65 years old). Children 5 and younger are admitted at no charge. Also, if it’s your birthday on the day of your visit to the Chocolate Museum, we will invite you for free on your special day!